Definition at line 955 of file MemStore.cc. Definition at line 959 of file MemStore.cc. Definition at line 1028 of file MemStore.cc. Definition at line 978 of file MemStore.cc. 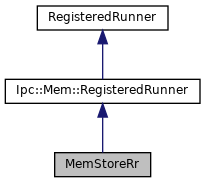 References Ipc::Mem::PageId::cachePage, MemStore::EntryLimit(), and Ipc::Mem::NotePageNeed(). Definition at line 1012 of file MemStore.cc. References assert, MemStore::Enabled(), MemStore::EntryLimit(), ExtrasLabel, Ipc::StoreMap::Init(), MapLabel, Must, shm_new, SpaceLabel, and SpacePoolId. Definition at line 984 of file MemStore.cc. References Config, YesNoNone::configure(), YesNoNone::configured(), DBG_IMPORTANT, debugs, Ipc::Mem::Segment::Enabled(), fatal(), SquidConfig::memMaxSize, SquidConfig::memShared, Ipc::Mem::PageSize(), MemStore::Requested(), and UsingSmp(). Definition at line 1005 of file MemStore.cc. Definition at line 972 of file MemStore.cc. Definition at line 971 of file MemStore.cc. Definition at line 970 of file MemStore.cc.